I am a fan of gudeg. 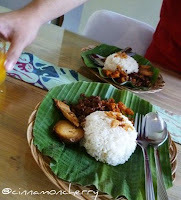 Gudeg is famous in Jogjakarta. It's a bit sweet and spicy (you can omit the spicy part if you wish) You eat it with steamed rice and sambal krecek (this is the spicy part). Gudeg is made from young jackfruit, sometimes with eggs or chicken. Many times, both. I spent a year of my childhood in this city, and gudeg is one of my comfort foods. It reminds me of family, of good times. They're complete--savory, salty, spicy, sweet. I am lucky because my partner loves gudeg, too. So, whenever we're in Jogja, we've been known to eat gudeg three times a day. Sometimes four! There are many kinds of gudeg. You can go to Jalan Wijilan in Jogjakarta, also known as center of gudeg.Walk around and choose on a whim! You can also buy it as a souvenir, since there's a canned version of this dish. Some prefer to eat gudeg with tea or orange juice. Me, I love es tape hijau. 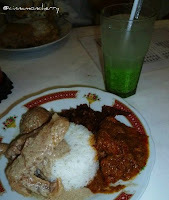 Yes, I love green, and yes, I love the taste, sweet and fresh after a hot day in Jogjakarta. Have you tried gudeg? Which ones are your favorite?